Saints and Sinners, owned by Channing Tatum is located in the middle of the french quarter, on Bourbon Street in New Orleans. This restaurant, bar and club was created to look like the red-light district bordellos and burlesque halls and they blew it out of the water in that aspect! The decor, especially in the back where we were sitting was very fitting for New Orleans and really felt like we were immersed in the culture of the city. The service was great at the restaurant! Our server was extremely attentive and helpful with anything we needed. She was prompt, patient and extremely nice. Two of our girls ordered a dish and ended up not liking it as much as they thought (explained below) and our server was very apologetic. The two that ordered the meals told her that it was okay and they would keep the meals, but I have a feeling that if they wouldn’t have said that, our server would have comped or replaced the meals with something that they liked. Great service all around! Now, for the best part: the food! Overall, I would say that the food was good. For an appetizer, we had the fried alligator tail. This was by far the best dish we tried! We LOVED it and I could have eaten 10 more dishes of it. So, so good. I will definitely be back for that! The BBQ shrimp and grits was the meal that we had an issue with. It was extremely spicy and did not taste like bbq at all. I really love spicy food, so I thought it was a great dish, but the other girls aren’t fans of spicy food, so they had a pretty negative experience. 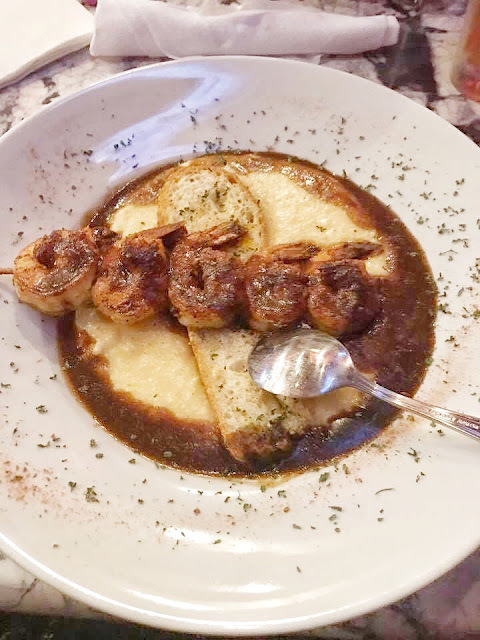 I think this is a good dish, but it should definitely not be called bbq shrimp and grits and it should change its wording on the menu to specify that it is spicy instead of sweet like some bbq sauces. 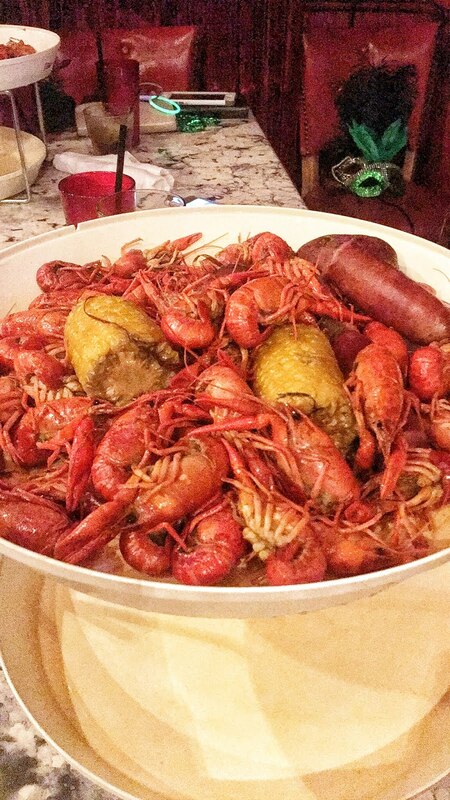 I had the crawfish and two of the others split the crawfish with potatoes and corn. They both loved it, while I thought it was good, but not great. We ordered a side of the sauce that went with the alligator tail and that really helped it a bit, for me. The spice level was good – not too spicy, but just right. I kept thinking that it was missing something, but I couldn’t pin point what it was missing. Other than the spice, it just tasted a bit bland. Maybe it needed some salt or something? I’m not sure. I cannot speak for the drinks myself because I did not have one, but everyone that did, was very satisfied! After dinner, we went upstairs to their private club. We had entry for free, but I think it is typically $10 or so? In my opinion, it wouldn’t have been worth it on that night. I am sure it varies each night, but the night we were there, it was slow. Overall, I think Saints and Sinners is a good restaurant and bar, but not great. As much as it pains me to say, I will probably not be back for dinner. The group I went with decided to go because the bride loves Channing Tatum and wanted to see him. I have a feeling that a lot of people go for that reason & get let down, but of course, that is just my opinion. 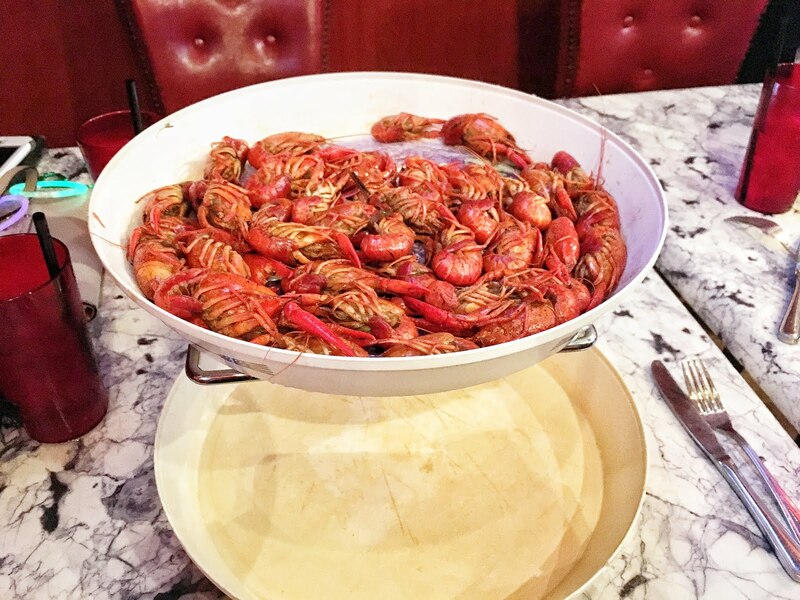 When I go back to Bourbon Street, I will definitely go in for the alligator appetizer and maybe a drink, but I do not think I will order dinner there again. Have you ever been to Saints and Sinners in New Orleans?